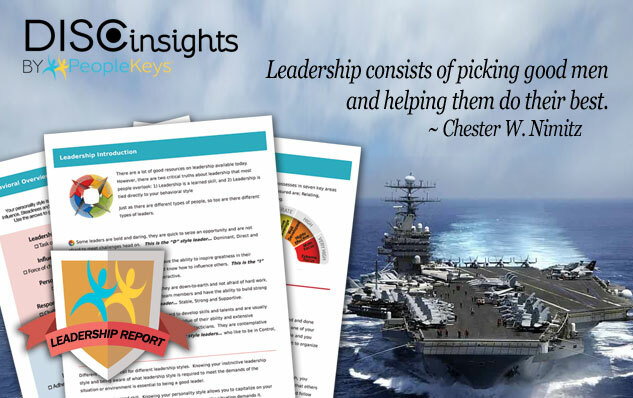 PeopleKeys Leadership Report provides you with the information you need to maximize your leadership potential and discover the best way to communicate and motivate those around you. PeopleKeys has over 35 years of experience in unlocking people's potential through Behavioral Analysis and personality assessments. Strategically applied personality systems can help with everything from optimizing talent management strategies to improving interpersonal communication. As a world leader in customized behavioral assessments and delivery systems, PeopleKeys prides itself on delivering excellent customer service an international platform, and the most customizable and tailored solutions around.